Join AATE for the 2018-2019 school year to for free attendance for quarterly meetings as well as a discount on your ISTE Membership! Makey Makey is establishing a global network of training partners that are working to advance invention literacy worldwide. We are pleased to announce that via our affiliation with ISTE, AATE will be an official training partner. As a partner, we will deliver a one-day "Makey Makey Invention Literacy Workshop" on Saturday, December 8, 2018, where participants will leave having a "Train the Trainer" certificate of completion. Our goal is to have 60 trainers certified by 2020. These trainers will then be able to deliver Makey Makey workshops wherever they please. Learn more about the program here. Currently, space is open to 20 participants. Who: This workshop is designed for people who train K12 educators (school-based as well as out-of-school). AATE will become Makey Makey’s newest “official training partner”. There will be no more than 30 people permitted in the workshop. The Lovett School, Rogers & Westmoreland Activity Center. 11:30 am - 12:15 pm Lunch (Provided at the workshop as part of your AATE Membership or registration fee). Bring Your Laptop & Charging cable: Windows, Mac, Chromebook, Linux operating systems work great. Tablets will not work. Regardless of the kind of laptop used, it must have the ability to plugin a USB “type A” plug - - these are the most common type of USB plugs and it’s how the Makey Makey is connected to a computer. Some new laptops don’t accept a USB type A plug so the user must supply their own adaptor (“dongle”). Everyone who attends receives a free Makey Makey Invention Kit, and if they stay through the end of the day, will also receive the Workshop Facilitator’s Guide. The Atlanta Area Technology Educators (AATE), organization began more than thirty years ago with six members. Current membership includes over 225 members with an average of 90-100+ members attending quarterly meetings. 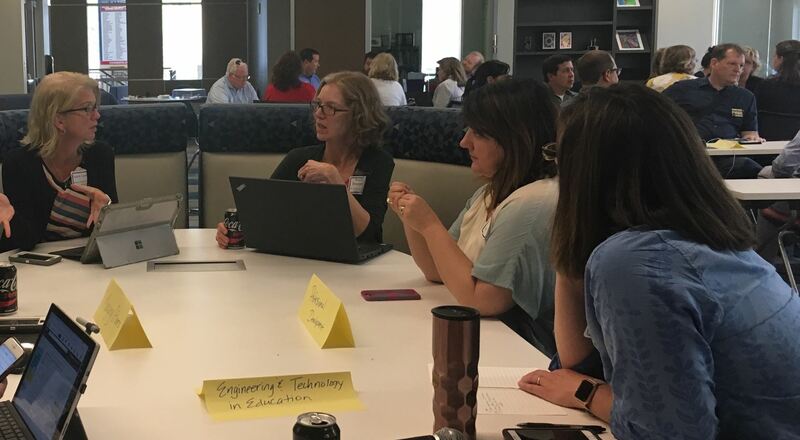 The members consist of technology teachers, classroom teachers, administrators from public and private schools, education and technology consultants, as well as a small number of vendors. Each year, AATE members meet quarterly to network and share ideas. Meetings occur on a school day from 11am-2pm during the school year, typically in September, November, February and April. Each meeting is hosted by a different member school and held on their school grounds. AATE is an Affiliate Organization of ISTE - International Society for Technology in Education. By becoming an AATE member, you qualify for a discount on your annual ISTE membership dues. AATE exists to support technology educators in networking, innovation and leadership. Atlanta Area Technology Educators is a 501(c)6 non-profit organization.